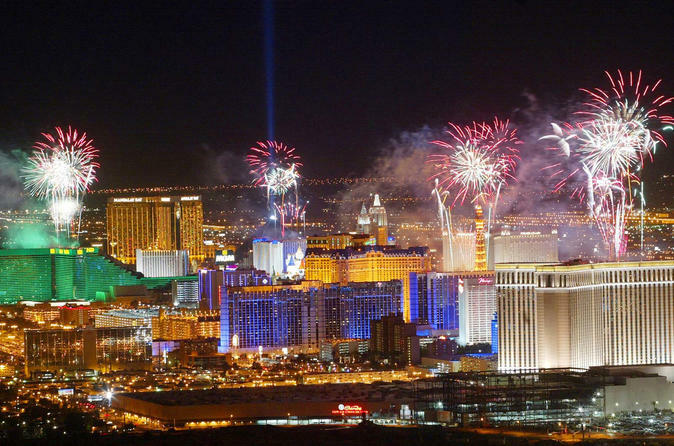 Take the new year by storm with this Viator Exclusive helicopter ride over the Las Vegas strip on New Year’s Eve. During this 3-hour experience, enjoy special treatment with transfer from your Las Vegas hotel to the helicopter terminal in a limousine. Before your takeoff time, sample hors d'oeuvres and sip Champagne. Hop aboard your aircraft for a 30-minute ride above the Strip as the clock strikes midnight and multiple casinos light off fireworks for a show you won’t want to miss. This Viator Exclusive tour is available nowhere else. Your driver picks you up from your Las Vegas hotel, and takes you over to the helicopter terminal in style in a limousine. Sit back and relax in the luxurious leather seats of your limo while 2016 gets closer and closer to an end. When you reach the terminal, indulge in some hors d'oeuvres and Champagne prior to your 11:45pm flight — it just wouldn’t be New Year’s Eve without Champagne. Listen to your guide’s instructions, and board your helicopter for your 30-minute ride over the Strip. When you’re up in the air, notice the beautiful sights of the hotels, casinos, and bright lights that define Vegas. As you ride and the countdown to 2017 begins, enjoy a spectacular fireworks show from your seat, avoiding the hassle of nearby crowds. Many casinos on the Strip light off special New Year’s fireworks, and there’s usually more than 80,000 launched around midnight. It’s truly a sight to see. Following your flight to usher in the new year, you'll be transported back to your hotel in a limousine. This experience is a Viator Exclusive, and it can’t be booked anywhere else.